The flute shouldn’t move around in the case and the case shouldn’t move around in the box. So first, put the flute inside its case and rock it gently upside down. You'll probably hear a little noise from the keys moving, but that's different from the distinct thump of the flute sloshing around. 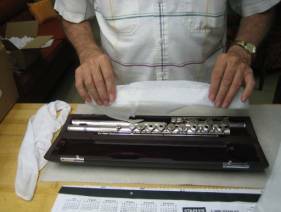 If you discover that the flute is moving, use some tissue paper, or even folded Kleenex, to lightly pack around the sections. Don’t pack so much in that the case has to be squeezed closed, it doesn’t take much to stop the parts moving. (For example, a small handkerchief is almost always too much material). Next put the flute case (and case cover) into a box with at least 6" of space on all sides to allow for packing material. (FYI – that means that the box doesn't have to be huge. 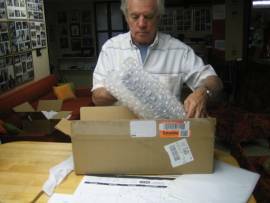 Flutes aren’t heavy and if you’re shipping by air (e.g. overnight or 2nd day air) you'll be charged by dimensions, not weight). Now, just wrap the case in 2 or 3 rounds of bubble wrap to make sure that it doesn't move around in the box and you’ve only got one last thing to do before you seal it up. When you ship your flute to us please include a quick note. It doesn’t have to be long or fancy, just review the problems we'd discussed and add a phone number where we can reach you.